Your profile has a new look! - Hello You! Your profile has a new look! Your profile has entered the modern age: now sexier and more practical! easier to find: direct access to the info you want, via a simplified menu with tabs and the possibility to browse through photo albums. more pics: display up to 3 XXL avatars, create, manage and easily organize your photo albums. AND each album can hold up to 96 photos. more comments: on your news, pics, and videos. 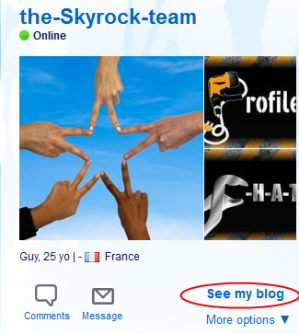 To go back and forth quickly between your blog and profile, click on See blog or See profile, which is right under the avatar! So which pic will it be? Put it up on your profile already and then let us know what's going down!